Embossing is a method of pressing a design into paper or card to create a three-dimensional image. First carried out in the 15th Century, embossing has been an effective printing technique for hundreds of years. After the paper or card has been embossed, the results are a raised surface with the design sitting higher than the surrounding paper. This is done with metal dies which fit into each other - one that’s raised and one that’s recessed. A paper sheet is placed between the dies before heat and pressure are applied. This pushes the raised die into the recessed one, reshaping the paper to your chosen design. Blind - blind embossing doesn’t involve any printing or foiling in the design. The process alone is what creates the text or design on the paper. Single Level - the image area is raised up to one flat level. Multi-Level - the design is raised to multiple levels, adding interesting textures on the piece. Registered - registered embossing is used to raise a foil stamp or printed image to give it a raised look and feel. Deboss - the opposite of embossing. A design is depressed into the material so that it sits lower than the rest of the paper or card. 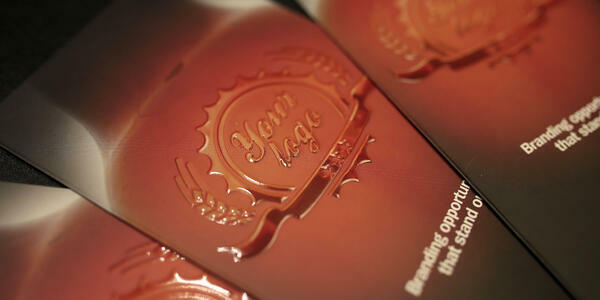 Embossing is a simple and effective way of improving the quality of any printed material, including business cards. Despite the rise of social media networking, a business card is still a useful tool to have at your disposal. Business cards are a popular use of embossed printing as they can take a simple design and transform it into an eye-catching and professional card. A regularly printed card will look fine, but the card might be the first impression someone has of your business. You don’t want them to think that your business is just fine, you want them to be excited and intrigued by you. An embossed business card helps you to stand out from the crowd and shows that you take your business seriously. It doesn’t have to be an over-complicated design. In fact, an embossed card that’s simple and sophisticated is more likely to create a professional first impression. An invitation is an opportunity to be creative. Whether it’s for a wedding, charity event or just a much-needed party, the design and printing of your invitation are important. It’s the first opportunity you have to generate a buzz around your event and it could be the difference between someone attending or giving it a miss. Using embossed printing techniques for your invitations gives them the all-important ‘wow factor’ that can convince someone to attend. The invitation should make the recipient feel special and valued, so the invite should reflect that. With embossed printing, you’re able to give your invitations an interesting texture that encourages someone to pick up and hold it. This ensures you have someone’s attention and helps to raise awareness of your brand and event. If you’re looking for the perfect wedding invitation printers for your special day, then we’d recommend looking at notonthehighstreet.com for wonderful printed invites. Brochures and leaflets are created with the intention of promoting your brand or the services that you sell. Because of this, they need to be enticing, eye-catching and worth someone’s valuable time. A regularly printed brochure is more likely to be ignored and thrown away because there isn’t that unique draw that’s needed to grab someone’s attention. With embossed printing, you’re showing the reader that this brochure is important and is worthy of their time. Because it’s such high-quality and feels good to hold, it’s less likely to be thrown away as the reader will appreciate the time and effort that’s gone into creating it. B&B Press print brochures and leaflets for all purposes, finding the perfect printing style to suit the client’s goals and requirements. For example, take a look at the leaflet we printed for Beatson Clark, leading manufacturers of glass packaging. They wanted to promote their bottle logo embossing service to prospective clients. Brands could have their own logo or design embossed onto the bottles, so what better printing technique than embossing to show off this fantastic service? Beatson Clark initially wanted a regularly printed leaflet, but once they saw the embossed alternative, they were thrilled. By recreating the bottle effect on the leaflets, their potential clients would get a much more tactile feel of the finished product they’d receive. The Beatson Clark leaflet is just one of the many creative printing projects we’ve worked on. We’re celebrating 60 years of amazing print creations with a special handbook. It showcases the different print techniques we provide and examples of our favourite jobs from over the years. To get your hands on a free copy of our handbook, click on the download link below.